A spectacular 2.5D fight, which was created based on a license of popular films and series for children Power Rangers. Production is characterized by an easy to master, but not devoid of depth combat system. It was created by nWay studio, Hasbro and Lionsgate. Power Rangers: Battle for the Grid is a 2.5D fight (a genre combining two-dimensional gameplay with three-dimensional graphics) based on the license of the once popular series for children (as well as a full-length movie from 2017) Power Rangers and created in connection with the 25th anniversary of the brand. The production offers simple but spectacular gameplay and several different game modes. nWay studio, Hasbro and Lionsgate are responsible for creating this title. The Power Rangers series tells the story of several people (mostly teenagers) who are chosen to fight evil. They use advanced technology - costumes that allow them to remain anonymous and thanks to which they have superhuman power and powerful, changing the form of combat machines (so-called zordes - robots, often resembling the appearance of various types of animals). Power Rangers: Battle for the Grid starts with a selection of heroes - on the list you can find several characters known from different versions of the series (including different incarnations of individual warriors, as well as their allies and enemies, such as Lord Drakkon) and having a different set of attacks. We choose three heroses at the same time, between which we can switch freely during the clash. 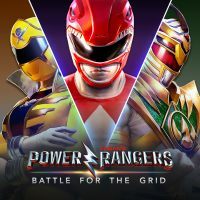 Power Rangers: Battle for the Grid is designed to make the basics of the game very easy to master, but - as the creators boast - the game also has enough depth to attract for longer. We won't find any complicated combinations of blows and we won't be forced to shoot a quarter/semicircle on a controller - most of the attacks can be done by pressing a single button. Power Rangers: Battle for the Grid lets you play alone or with friends. Those who prefer single player gameplay can take advantage of the Arcade feature mode, while those who like to compete with others will be able to do so both locally and via the Internet. What is important, the production supports the so-called cross-play - owners of computers and Xbox One and Nintendo Switch will be able to play together (unfortunately this does not apply to players playing on PlayStation 4). For example, if you unlock an additional costume while playing on a computer, you can also use it on the Nintendo Switch - provided that you have both versions of the game, of course). Power Rangers: Battle for the Grid has an eye-catching three-dimensional graphics that well captures the characteristic climate of Power Rangers. The character models are detailed and nicely animated - above all, spectacular animations of special attacks make a great impression. Also, the boards present in the game look decent, faithfully reproducing the various places known from movies and series.